It was a nice weekend, except perhaps a bit blustery at times, at the Fort Sage Mountains BLM trailhead. Bruce got this shot from a nearby hill. The BLM is making improvements to this site. The vault toilet was moved and now has a solar night light. It still smelled of fresh paint. Additional parking is being prepared, new fire rings, and new trails and markings. The kiosk also had information about two other nearby trailheads. Dates for the April rally at Ft Sage are Thursday April 18 to Sunday 21, 2013. 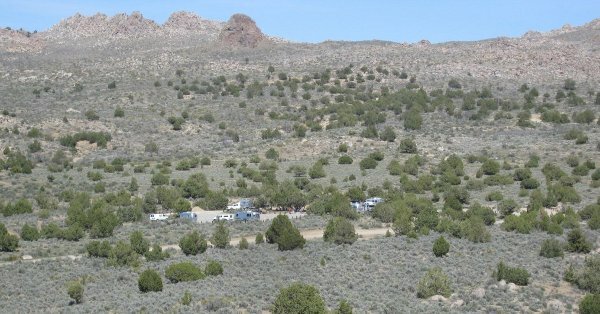 This is a BLM campground and off road trail head near Doyle, CA, with panoramic view of the valley below. It’s about 45 miles north of Reno off Hwy 395. A word of caution, follow the directions on the SNU website and go past Doyle to Laver Crossing about 2 miles from the north end of the Doyle loop. Following your GPS may lead you to a road through Doyle that goes over a narrow bridge that is not rated for trucks and trailers. Be sure to bring wood for campfires.